When Linde, one of the world’s leading gas and engineering companies, took part in the Saudi Arabia International Oil and Gas Exhibition in 2008, Saudi Aramco published a declaration of intent to invest over $100 billion in the transportation of gas and oil, gas plants, refining and petrochemical systems over the following five years. Not least as a result of this announcement, Linde decided to strengthen its activities in the region significantly in order to meet the needs in the booming market. The decision also reflects the changes to the traditional customer structure of the globally active plant construction company, the majority of whose customers now come from such growth markets as the Middle East, India and China. At the same time, the growing number of Asian competitors makes it clear that international plant construction companies have to adapt flexibly to their customers’ expectations in order to exist in new markets with persuasive offers. Linde is following this trend with offices in Riyadh, Al Khobar and Abu Dhabi. • In November 2006, the Linde/Consolidated Contractors Compagnie consortium was awarded a contract to construct a ethane cracker at Ruwais, Abu Dhabi. The plant has an annual capacity of 1.5 million tonnes. • In November 2007, Linde and Adnoc under their joint venture – Elixier – agreed to produce industrial gases to supply customers in Abu Dhabi for the long term. Only a few months after founding the joint venture, Elixier appointed Linde to construct two air separation plants at the Mirfa location between Abu Dhabi City and Ruwais. The two plants, with a total investment of $800 million and total capacity of 670,000 standard cubic metres of nitrogen per hour. • In July 2009, Borouge appointed Linde to construct another ethane cracker in Ruwais/Abu Dhabi. The cracker with annual capacity of 1.5 million tonnes of ethylene will increase the total capacity of the current production of polyolefines to 4.5 million tonnes per year by the end of 2013. • In November 2009, Sabic and Linde publicised the first successful commercialisation of the α-Sablin technology for producing linear alpha olefines, which was developed jointly by Sabic and Linde. • In October 2010, a consortium involving Linde and Samsung were given the order to build an acrylic acid plant in Al Jubail. The plant will be delivered turnkey at a fixed price of $1.1 billion to Saudi Acrylic Monomer Company (Samco). 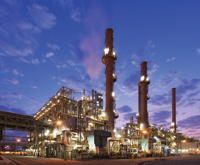 • In April 2012, Linde’s Engineering Division was awarded a major contract by the group’s gases division. The $380 million order is for the turnkey construction of a two-stream HyCo plant plus a single-stream ammonia plant with a large storage tank. The new plants will enable Linde to provide long-term supplies of carbon monoxide, hydrogen and ammonia to the Sadara Petrochemical Company (Sadara) in Jubail.